Have you got a weekend? I’d like to suggest doing the Cascade Loop. This National Scenic Highway will take you to the best parts of Washington State. The Cascade Loop starts north of Seattle in Everett and takes you into the Cascade Mountains, over Stevens Pass; into the Columbia River Valley apple and wine country. Travel up the Columbia River to Lake Chelan, north to Winthrop, pick-up the North Cascade Highway 20, heads west through Washington Pass, the North Cascades National Park wilderness and into the Skagit Valley and Whidbey Island. Note: The North Cascades Highway 20 is closed from November to May. Check for dates. Travel north from Seattle on Interstate 5 to Everett, the site of the Boeing Tour Center. You’ll want to make reservations to see Boeing Jets being built. 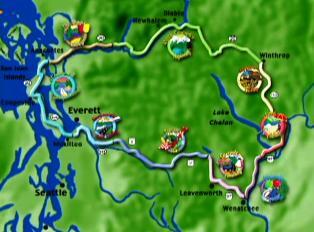 Leaving Everett, Highway 2 heads east though towns like Snohomish, Sultan and Gold Bar. Stop at a bakery or farmers market in this area for picnic supplies to enjoy at a roadside park. Highway 2 follows the Skykomish River through superb whitewater rafting and fishing areas on the way to the summit. This area known as Wild Sky Wilderness has a number of forestland and lake trails to explore. Take this scenic drive to climb 4,061 feet Stevens Pass one of the prime winter downhill and cross-country ski areas in the Cascades. Summer trips through the pass only offer a pit stop; the lodges are closed. Lake Wenatchee is the next stop on the Cascade Loop. The State Park gives you a chance to get a walk on the sandy beach or a forest hike. Back on Highway 2 you drive through Tumwater Canyon, along the Wenatchee River and into the Bavarian Village of Leavenworth. I mean this is the real thing with German restaurants, shops filled with imports and local crafts, a beer garden and local merchants in authentic costumes. It’s easy to spend the whole day here. If time gets away from you; consider an overnight in an Austrian pension or a rustic mountain inn. It’ll add to the fun. Wenatchee is the next stop on the Cascade Loop. This town calls itself the ‘apple capital of the world’! There are fruit stands and vineyards all around the area. Take time to sample Washington wines at an ‘award winning’ winery. This is your first chance to see the mighty Columbia River. Parks and trails go along its banks and water sports like river rafting, jet skiing and kayaking are favorites. Get an amazing view of the Columbia River Valley when you drive to Ohme Gardens, perched on a bluff outside of town. I like to enjoy a relaxing break in this lovely alpine garden. The Cascade Loop goes north along the Columbia River to Lake Chelan. The town of Chelan is the starting point for a 50 mile ‘Lady of the Lake’ boat trip to Stehekin. Disembark here to tour the Stehekin Valley; southern gateway to North Cascades National Park with hikes, horseback trails and whitewater rafting. At the town of Pateros the Loop leaves the Columbia River and heads into the Methow Valley. Hold on to your hat because the Wild West town of Winthrop is the next stop. It’s like stepping back into a frontier town with colorful Main Street, boardwalks, hitching posts and saloons. I think a top place to stay in the Valley is Sun Mountain Lodge. The restaurant and wine cellar are legendary. At the Lodge, reserve a horse or a mountain bike to explore the backcountry. As you drive down the west slope of SR 20 - views of Diablo Lake are next. From this view point you’ll get and idea of the size of the Seattle City Light Project that harnesses the Skagit River for power in the city of Seattle. In Newhalem stop at the North Cascades National Park Visitors Center to get the latest information on all the fun hiking, biking and rafting trips to enjoy. I like to take a Diablo Lake Boat Tour for forest and mountain views of this amazing area. Make a boat reservation at www.skagittours.com. Leaving the park, Highway 20 follows the Skagit River through towns like Marblemount, Concrete and Sedro Woolley. The Loop takes you into the rich Skagit Valley, a prime farming area for spring tulips, summer berries and vegetables. The Cascade Loop goes on to water adventures on Fidalgo and Whidbey Islands. If you want to see Orca whales Anacortes is the gateway to the whale watching San Juan Islands. Go aboard a Washington State Ferry to sail to Lopez, Orcas and Friday Harbor on San Juan Island. Book a whale watching tour to see these illusive creatures. Whidbey Island is the final leg of the Cascade Loop. The road winds through lakes and forests to the Deception Pass Bridge. It’s fun to stop at Cranberry Lake in Deception Pass State Park for a picnic and walk on the salt water beach below the bridge. Driving South, Oak Harbor, Coupeville and Langley are historic towns with main streets of shops and cafes to explore. The Cascade Loop adventure ends with a drive to Clinton where you catch a Washington State Ferry to Mukilteo. Drive up the hill, by the Boeing plant to pick up I-5 back to Seattle. Now you can see why this trip will take at least two or three days. There is so much to see on the Cascade Loop!